My name is Harsh K. Luthar and I am a Professor of Management in the College of Business at Bryant University. This is my personal blog using the WordPress publishing system. A number of International scholars from England, India, Egypt, Germany, U.S., and other parts of the world support my efforts on promoting Interfaith understanding and peace and write regularly on this site. Without the help of my friends from all continents, this site would not be what it is today. This blog is dedicated to my parents Raj and Rajindar S. Luthar. Here are some pictures of them. In one of the last pictures I have of my father, he is holding my youngest daughter and smiling and I am sitting next to them. My father is survived by his wife, my mother, Raj Luthar; as well as by three sons, Harsh Luthar, Navneet Luthar, and Vipan Luthar, and their families. He left behind seven grandchildren. Rajindar S. Luthar was a scholar, an educator, and a Professor of Mathematics. 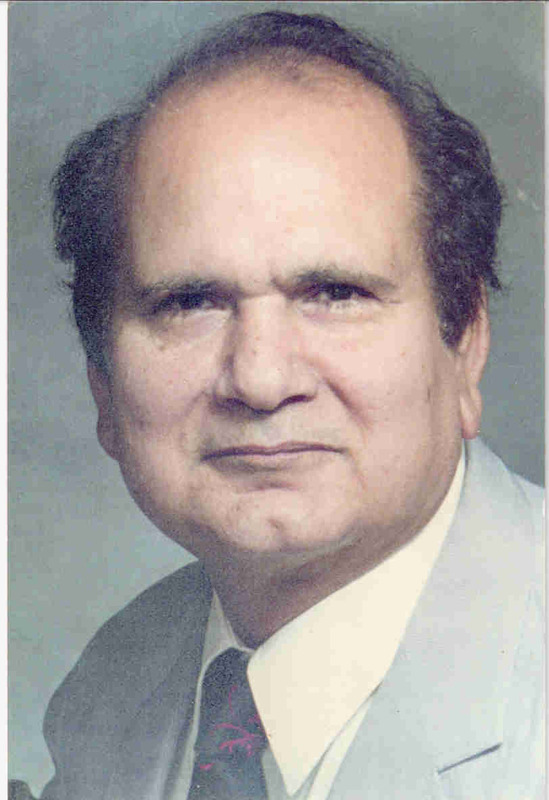 He loved and lived math education and taught algebra, calculus, linear algebra, abstract algebra, and differential equations to thousands of students who had the good fortune of taking his classes. We were all his students. My father taught us well. He was a pillar of strength and support through many adversities and was our guide and protector. I miss him every day. Here are a couple of things that I have written about my father. 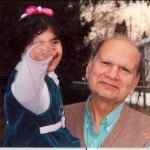 My father had an interest in everything that had to do with life, love, food, religion, gurus, gardening, walking, friendship. He loved to tell stories and entertain, and had a big laughter that put people at ease. His variety of interests in all aspects of life broadened my own views. You can find my writings, along with those of my friends, ranging from the topic of Underdog and Sweet Polly Purebred to spirituality and religion. Overall, this blog primarily has a spiritual/psychological/religious orientation and this is reflected in the essays, poetry, and stories. Like my father, I think and write about love, life, religion, gurus, compassion, food, relationships, education, personal growth, meditation, yoga, or whatever else strikes my fancy. Once in a while, I also write about professional issues of interest to me in the context of management, technology, business, and society. I love the open source software movement and am a big fan of WordPress. This is why I am using WordPress to publish my blog. As my father before me, I am an active scholar and a Professor. I publish in academic journals and give interviews in both the television and print media. I have appeared on the Rhode Island PBS show 13th State with Paul Zangari in six separate half-hour interviews related to my research in education and management as well as my personal interests. These interviews have included discussions on the importance of corporate ethical behavior in society, use of Internet as a community builder, the trend of outsourcing to India and China, employee loyalty in today’s organizations, stress management in work and life, the role of gender in workplace perceptions, and related management issues. I have also given a number of presentations at the annual Academy of Management meetings and written articles in the areas of International Human Resource Management, Business Ethics, Gender and Race in the workplace, Sexual Harassment, and Leadership. Besides my professional pursuits, I am deeply energized by my zeal for understanding the potential for human growth in all its aspects. Truly, this blog is devoted to understanding and applying our passions, intelligence, and sensitivity to achieve personal growth and success professionally, and evolve mentally, physically, and spiritually as enlightened human beings who work for the benefit of humanity and promote peace. A number of interests have enriched my life in various ways. These include the philosophy of nonviolence (known as Ahimsa in Sanksrit), meditation, yoga, reflective self-inquiry, community building, poetry, and a variety of vegetarian diets including fruitarianism, raw food vegan diet, and the more mainstream lacto-ovo vegetarian diets that include milk, yogurt, eggs, and cooked foods. I was attracted to inner mental and spiritual exploration through the practice of yoga and meditation in early childhood in India. Later, we came to the U.S. My father taught at Colby College in Maine for a couple of years in the mid 1960s and ultimately we settled in Wisconsin. I received my B.A in Philosophy from Beloit College in Wisconsin. After college, I studied the philosophy of Ahimsa (nonviolence) and its role in the contemplative spiritual traditions with the Jain master Sri Chitrabhanu-ji for four years. My main area of interest is in the teachings of Sri Ramana Maharshi, the Indian Sage of Arunachala. Ramana Maharshi emphasized the method of reflective self-inquiry that involves bringing quiet attention to the sense of being and identity. I will continue to develop this blog and hope you enjoy the material posted here. The contents of this blog site are based upon the opinions and views of Dr. Harsh K. Luthar and other authors who write here; unless otherwise noted. This blog site is not endorsed or supported by any institution or organization. The site focuses on general issues of lifestyles, personal development, and enlightenment as these pertain to living, working, engaging in relationships, as well as the business and ethical context of commerce and technology. Stories, poetry, and the artwork found on this site are typically presented within a philosophical, reflective, analytical, and a meditative framework. Luthar.com is not meant as a substitute for professional advice of any kind. No warranties or guarantees are offered as to the quality of the opinions and views expressed here. Luthar.com is not meant as a substitute for professional advice of any kind. No warranties or guarantees are offered as to the accuracy or quality of the opinions and views expressed in the articles on this site. Many scholars, professors, yoga teachers, nutritionists, vegans, raw food advocates, and alternative health care practitioners, and other friends write on this blog site. They express their understanding of metaphysics, epistemology, as well as the more practical issues of lifestyle, nutrition, and health within their own frameworks of training and conceptual thought as well as their spiritual and religious orientations. No warranties or guarantees are offered as to the accuracy or the quality of the opinions and views expressed by the authors who write on the site. If you have any questions about your mental or physical health conditions, symptoms, or illness, those questions should be directed to your personal health care providers. The articles and poems on this site are meant to be in the spirit of inspiration, exploration, and freedom of expression and embody enlightened and good natured entertainment. It is absolutely critical that you seek explicit and written permission from Dr. Harsh K. Luthar and other authors appearing on this site, whose work you wish to use or exhibit elsewhere. (c) Copyright 1997-2017. Dr. Harsh K. Luthar. All Rights Reserved. ©Copyright 1997-2017 Dr. Harsh K. Luthar. All Rights Reserved. If you wish to contact Dr. Harsh K. Luthar, please fill the contact form below. Thanks. Nice to read about your biography. Many in India like philosophy of non-violence.India has not invaded any country. But non-violence is not the outcome of any practice.Unless one is in state of love, he cannot be non-violent. Just as love cannot be practiced, non-violence cannot be practiced.If one understands why one is violent, out of this understanding comes the flowering of non-violence which is actually a state beyond violence. Thank you Dr. Raju for your comments and insights.